Depending on what culture you come from, weddings are either expensive or I-could-buy-a-house-in-Sydney-with-that-money expensive (trust me, I come from the latter). Since it’s such a big expense, trying to save money on your wedding is likely to save you more than trying to skip coffee once a week! Most advice on how to save money on your wedding is stuff like: “everything is negotiable” or “give handwritten letters as favours” or “don’t tell your suppliers it’s a wedding till the last minute”…which is all completely legitimate, but very generic really. I’m going to show you where to go to find cheaper alternatives to your biggest wedding costs. And let’s get clear: it’s not about having a ‘cheap’ wedding. It’s about getting more value for less money. Oooo. Now we’re talking! While price is static, value is different for everybody. ‘Value’ is about how much are you getting out of it? How important is it to you? How much of a difference does it make? 1. What do you & your partner value the MOST? The biggest mistake is thinking that everything matters and everything needs to be great. Here’s a secret: the key to a great event is making it memorable. And the key to being memorable is having one thing that you do really, really well. No one notices everything. So figure out the things that are non-negotiably important to you and your partner. This is the stuff that is worth spending money on. 2. What do you & your partner value the LEAST? Upcycled Bride: This is an online marketplace to buy & sell preloved wedding items. It has a huge variety of inventory – not just decorations, but everything wedding related! If you haven’t discovered the world of Facebook Groups…you are waaay behind. There is a whole other universe on Facebook. You can find Facebook Groups on just about anything — but importantly, there are a tonne of ‘second-hand’ Facebook Groups where people in your local community are selling just about everything. (To find more of these, you can just search for “wedding buy sell” Facebook groups). Canva: This isn’t a wedding invitation service, it’s a graphic design tool. For those of you who want to create your invite from scratch, this is a great tool to use. Canva provides a tonne of great templates to get you started, and endless customisation opportunities. And (depending on the customisations you use) you can get the design for free! Just download it, and email it to your guests. I am a massive, massive fan of Canva. I fan-girl over them so much, they should really start paying me. Paperless Post: These guys provide an end-to-end service when it comes to designing and distributing your digital invitations. They have a huge range of free designs to choose from, AND they provide the option of printing paper invites, so you can have the best of both worlds. Greenvelope: Greenvelope are similar to Paperless Post. You can do a free trial to test out all their features. They also offer a comprehensive tracking system to help you manage your guest list and RSVPs. Wedivite: Wedivite allows you to send an invitation for free! The custom design options are limited, but there are other cool features: e.g. guests can sign an online guestbook, and upload their photos of your wedding to an online photo album. These digital invites are also mobile-friendly. Sure, it would be super handy if your mum was an awesome baker, but this is the next best thing: instead of paying premium fees for a professional bakery, you can get one from your local hobby-ist. GetFoodi: GetFoodi is an online marketplace that connects freelance/hobby bakers with people looking for baked goods. It’s like Etsy for cakes. If you’re worried about quality, have them bake you a few samples in advance, so you can test them out. If you need any more convincing, just check out the talent of their bakers on instagram! WedShed: WedShed is an online directory of ‘alternative’ venues in Australia. They find spaces like barns, estates, and outdoor spaces that aren’t traditionally used for weddings, but would make amazing wedding venues. Most ‘traditional’ wedding venues and function centres charge hefty premiums, because they’re offering you a whole lot of services (not just the venue): e.g. decoration set-up, food service, placement of favours etc. Finding an ‘alternative’ venue can help you save money big time, especially because you cut out a lot of the extra costs and charges that come with traditional venues. Plus…at least you’re wedding venue will be memorable and unique! Most local councils have a whole host of venue spaces they hire out to the general public. Some of these spaces are actually really awesome-looking! You can usually find the venues by going to your local government’s website. This proves significantly cheaper than hiring a traditional wedding venue space. Just remember, you’ll only be hiring the space — you’ll need to organise everything else (decoration, set-up, pack-down, food service etc). If you have a great team of family and friends who are happy to help, this shouldn’t be a problem! EverSnap: This app will compile all your guests’ photos into an online album. They can use cool filters before they upload their photo. And you even get cute instruction cards to distribute to your guests to let them know how to upload their photos! The price ranges from $99 – $399. So it’s not free, but it is a fair bit cheaper than getting a professional wedding photographer! MyWeddingDJ: This app will manage your playlist, and will even crossfade songs so there isn’t dead time between songs. Of course the onus is on you to pick great music, but assuming you have good taste, your guests won’t even notice the difference! Using any combination of these ideas will save you literally thousands of dollars. Have you used any of the above? 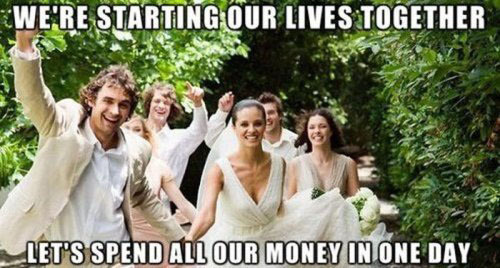 Or have you got some other great money-saving tricks for weddings? I’d love to hear them in the comments below!